Personalized Folding Beach Chairs, Custom Printed in Bulk. Promotional, Inexpensive. Red, Royal Blue w/ Floral Design. Best Price in USA and Canada. Personalized Folding Beach Chairs, Custom Printed in Bulk. Promotional, Inexpensive. Red or Royal Blue with Floral Design. Budget Prices in the USA and Canada. 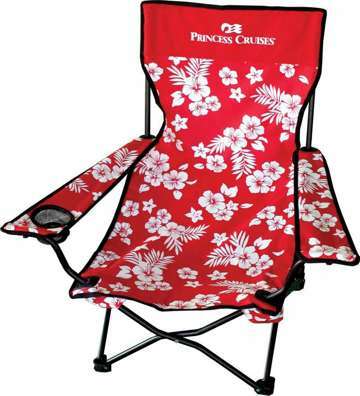 Heavy duty bulk outdoor folding beach chairs with carry bags. They may be used as beach chairs, camp chairs or lawn chairs. Free artwork design. We will send you a proof for your approval before production. Budget Prices in USA and Canada for wholesale personalized beach chairs. American clients pay no taxes. Contact us for the price of blank (not imprinted) beach chairs. Unit prices include your 1-color custom imprint. Add the amount shown for extra imprint colors. Screen Charges: $45.00 per color. 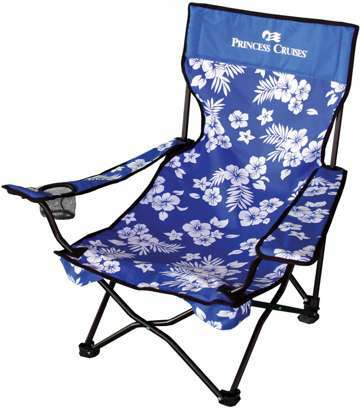 Less than Minimum fee: $62.50 (Absolute Minimum: 18 beach chairs). Production Time: 10-15 days after art approval.